Pakistan fell short by four runs as New Zealand won the nail-biting first Test in Abu Dhabi on Monday. Debutant spinner Ajaz Patel took five wickets to lead a never-say-die approach from New Zealand bowlers as they pulled off a thrilling four-run win over an indisciplined Pakistan in the first Test in Abu Dhabi on Monday. 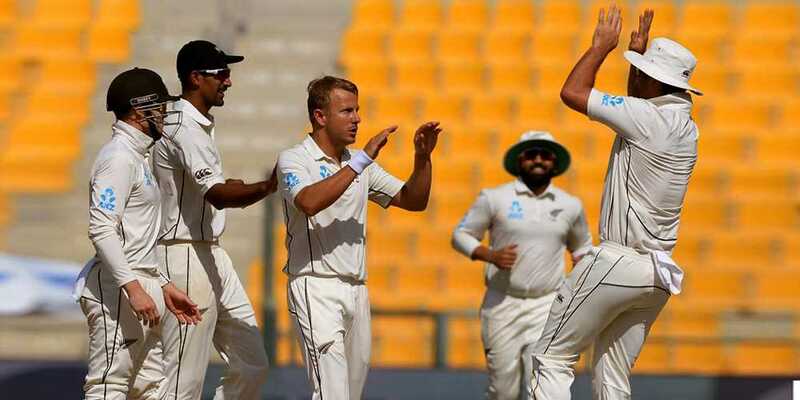 Defending a modest 176-run target, New Zealand bowlers led by Patel (5-59), fast bowler Neil Wagner (2-27) and Ish Sodhi (2-37) bowled out Pakistan for 171 on a drama-packed fourth day at Sheikh Zayed Stadium. It is the fifth smallest win in terms of runs in Test cricket history and gives New Zealand a 1-0 lead in the three-match series. Azhar Ali fought a lone battle for Pakistan with 65 and was the last man out when he was trapped leg-before wicket by Patel. He reviewed Bruce Oxenford’s decision but the television replays upheld the decision. Resuming on 37 without loss, Pakistan began the day as favourites to chase down the 176 they needed for victory although New Zealand will have taken some hope from Pakistan’s failure at the same ground last year to chase 136 against Sri Lanka. Kiwi spinners Patel and Ish Sodhi opened the bowling and immediately caused problems as Pakistan lost three wickets in the first six overs. Imamul Haq was trapped leg-before for 27 to a full length ball by left-arm spinner Patel in the fifth over. In the sixth, Sodhi had Mohammad Hafeez caught in the covers and then three balls later held on to a return catch low to his left as Haris Sohail drove a full toss back at him. Pakistani nerves were eased by the sight of Azhar and Asad Shafiq carefully rebuilding the innings with a fourth wicket partnership of 82. Shafiq made a cultured 45, becoming the 11th Pakistani to reach 4,000 runs in Test cricket, but his dismissal in the last over before lunch, edging Neil Wagner to wicketkeeper BJ Watling, changed the game as Pakistan lost their final seven wickets for just 41. After lunch, Babar Azam ran himself out for 13, the guilty party in a mix-up with Azhar and skipper Sarfraz Ahmed fell for a second time sweeping Patel, this time gloving the ball to Watling. Bilal Asif tried to slog a straight ball from Patel and was bowled leaving Pakistan 154 for seven, still 22 runs short of victory. In the next over Wagner had Yasir Shah caught in the slips and then Hasan Ali attempted a slog-sweep off Patel, picking out substitute fielder Tim Southee on the midwicket boundary. Azhar then tried to inch Pakistan across the line, farming the strike from Mohammad Abbas. But with five runs still needed to win Patel found the delivery to win the match for New Zealand. The second Test starts in Dubai from Saturday while the third and final, again in Abu Dhabi from December 3.